Or is it the other way around? Fortune's David Kirkpatrick goes on the road to Beijing with Bill Gates, who threw his business model out the window. (Fortune Magazine) -- Mr. Bill Gates! Mr. Bill Gates!" a young woman shrieks as the black car pulls up. A pallid student in a nylon windbreaker pushes his way through the security line and hands the world's richest man a small envelope with a floral design. "It's very important," he pants. Bill Gates at a gala dinner with government leaders in Beijing. Gates' trip included chummy meetings like this one with Tsinghua University president Gu Binglin. Gates groupies: Computer scence students wait for a glimpse at Tsinghua. In China, Microsoft does things the Chinese way. CNNMoney's Jim Ledbetter and Fortune's David Kirkpatrick discuss the new ad technology deployed on Yahoo! and whether it will dethrone Google. No other Fortune 500 CEO gets quite the same treatment in China. While most would count themselves lucky to talk with one of China's top leaders, Gates will meet with four members of the Politburo on this four-day April trip. As one government leader put it while introducing Gates at a business conference, the Microsoft chairman is "bigger in China than any movie star." 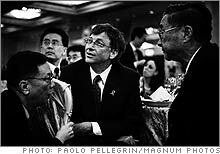 Last spring President Hu Jintao toured the Microsoft campus in Redmond, Wash., and was feted at a dinner at Gates' home. 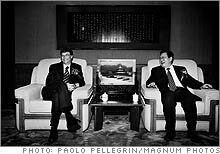 "You are a friend to the Chinese people, and I am a friend of Microsoft," Hu told his host. "Every morning I go to my office and use your software." It was not always so. 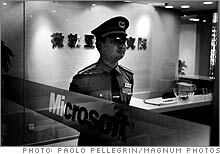 Microsoft bumbled for years after entering China in 1992, and its business was a disaster there for a decade. It finally figured out that almost none of the basic precepts that led to its success in the U.S. and Europe made sense in China. There Microsoft had to become the un-Microsoft - pricing at rock bottom instead of charging hundreds of dollars for its Windows operating system and Office applications; abandoning the centerpiece of its public-policy approach elsewhere, the protection of its intellectual property at all costs; and closely partnering with the government instead of fighting it as in the U.S., a stance that has opened the company to criticism from human rights groups. 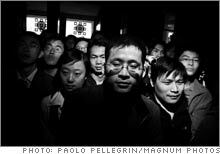 "It took Microsoft 15 years and billions of dollars of lost revenue to learn how to do business in China," says Sigurd Leung, who follows the company at research firm Analysys International in Beijing. "We were a naive American company," concedes Gates in an interview in his car as he is driven to yet another meeting with government leaders. "You've got to just keep trying and trying and trying." But now, he says, snacking on Pringles and Diet Coke, "we have a wonderful position in China, and we're going to see great growth every year for the next five years." Gates says he's certain China will eventually be Microsoft's biggest market, though it may take ten years. Projected sales this year are already three times what they were in 2004, yet still less than annual revenue in California. (Microsoft will not disclose figures, but Fortune estimates China revenue will exceed $700 million in 2007, about 1.5% of global sales.) Now Microsoft even has its own five-year plan in China, formulated to match up with the government's. Says Robert Hormats, a longtime China watcher at Goldman Sachs: "It's a great turnaround story with wonderful lessons for other companies." The problem wasn't brand acceptance; everyone was using Windows. It's just that no one was paying. Counterfeit copies could be bought on the street for a few dollars. As Ya-Qin Zhang, who heads Microsoft's Chinese R&D, puts it: "In China we didn't have problems with market share. The issue is how do we translate that into revenue." Mundie also began talks with Chinese security officials to convince them that Microsoft's software was not a secret tool of the U.S. government. As a result, in 2003 the company offered China and 59 other countries the right to look at the fundamental source code for its Windows operating system and to substitute certain portions with their own software - something Microsoft had never allowed in the past. Now when China uses Windows in President Hu's office, or for that matter in its missile systems, it can install its own cryptography. But it was a relatively small step in 1998 - the opening of a research center in Beijing - that proved a turning point. "We just started it here because we thought they'd do great research," says Gates, who raves about the quality of the country's computer scientists. The lab was what Gates calls a "windfall" for Microsoft's image. It began accumulating an impressive record of academic publications, helped lure back smart �migr� scientists, and contributed key components to globally released products like the Vista operating system. The lab soon became, according to polls, the most desirable place in the country for computer scientists to work. Today Gates openly concedes that tolerating piracy turned out to be Microsoft's best long-term strategy. That's why Windows is used on an estimated 90% of China's 120 million PCs. "It's easier for our software to compete with Linux when there's piracy than when there's not," Gates says. "Are you kidding? You can get the real thing, and you get the same price." Indeed, in China's back alleys, Linux often costs more than Windows because it requires more disks. And Microsoft's own prices have dropped so low it now sells a $3 package of Windows and Office to students.